I believe organisations have started to become much more natural, organic and are less pyramid shaped hierarchical. 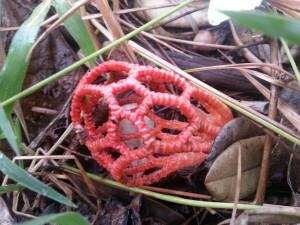 These combined networks, teams and communities I refer to as a Red Basket like the fungi you find in nature. The power of information availability, democratisation and a developing mindfulness are changing where power resides and our leadership approaches. In NTCs multi-directional information flows are accelerated and supported by social media and globalisation in the digital age. In organisations today everyone has a leadership role influencing and encouraging each other to collaborate on a shared purpose. Some of the current ways we organise in society are networks, teams and communities (NTCs) where leaders must be more facilitators and coaches to achieve a shared purpose. Leaders roles continue to be largely about leading change, influencing and communicating. There is a blurring as to what organisation looks like in the profit and non-profit sectors as they embrace collaboration, volunteerism and engagement. The profit making firm has become more a team and community organisation where people have an affiliation or belonging. The glue of the firm is the culture with congruent values and attitudes like many not for profit teams and community groups. Our interdependence in a desire for a healthy planet seems to be better understood globally as we work for sustainability in our organisations and leadership practices. Working with nature for a mutual benefit can be seen in examples like the dolphins and fisherman of Brazil helping to herd fish together and then sharing a bountiful catch. Also, working to protect the natural values of the Great Barrier Reef can similarly be seen as a way to maintain jobs in tourism and keep a healthy planet at the same time. The power of the social media and press campaign in Germany and Australia by GET UP is a good example of the global leadership role being taken on by many people in the environmental movement. This action helped to stop funding by a large German Bank of a coal port development in Queensland. A significant media campaign aimed at the Annual General Meeting of the Deutsche Bank resulted in the developer Indian company Adani being unsuccessful for a development loan. Banks are the powerful players on the global stage with leadership decisions around corporate social responsibility being significant. The mindful leadership role being taught by Professor Bill George at Harvard Business School should be commended as innovative. Students are asked how they could make a positive difference for their colleagues, their organisations, their families and society as a whole as their measures of success as leaders.